You are here: Home / Books / What books on women in sport do you read? Watching Katie Taylor power her way toanother beltat the weekend sent me back to Malissa Smith’s excellent book on the history of women’s boxing. And then onto other books hiding on my shelves, and a list of books to buy or borrow. So firstly, if you haven’t read Malissa’s book simply calledA History of Women’s Boxing then start with this reviewand follow the links to buy or download. Irish boxer and boxing pioneer really Deirder Gogarty wrote a book on her own experiences. 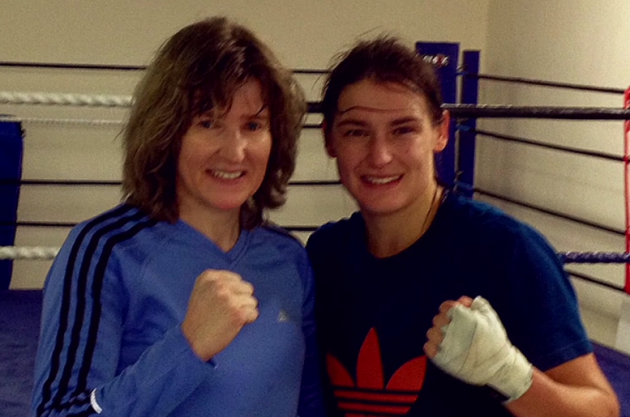 This is the woman who inspired Katie Taylor and showed her that a life in the ring is possible. A great read even though upsetting in parts to think how limited her opportunities were – incredible that she pulled it off to build a career in spite of all the opposition. Review ofMy Call to the Ringand links here. Australian journalist Misha Merz wrote two books on boxing, you can seea review of Bruising hereVery different to Malissa’s book as it’s a personal journey through the challenges and mental conflicts of boxing; fascinating read whether you agree with everything in it or not. Everyone’s experience is different. I loved Ronda Rousey’s book My Fight Your Fight – and love it even more now that I see her reinventing herself again for WWE. Some women just love to fight; she’s been a Judoka, an MMA fighter and now that intense mix of theatre and fighting.Read my review here. I’ve downloaded The Sweeter Science by Thomas Gerbasi which looks great. He’s interviewed everyone from Christy Martin to Noriko Kariya.It’s on Amazon here. And if you need more inspiration, some of these comic-images are just brilliant. Some jaw-dropping for their sexism but mostly I was surprised to see how many positive images I found.Pinterest Real Girl Sport. What women in sport books do you read for inspiration?